Don’t bother coming home. Especially if everyone’s still awful. Gambling addict Michael Chambers (Peter Gallagher) is doing the best that he can with what he has. He returns to Texas for his mom’s wedding and soon realizes that not a whole bunch has changed, except that everyone’s kind of grown-up a bit and having to deal with their lives being kind of crappy. He has an affair with his ex-wife, Rachel (Alison Elliott), who is now seeing thug Tommy Dundee (William Fichtner), a person who does not like Michael one bit. But somehow, Michael gets himself into a bit of a pickle that he can’t get out of and is now forced to pull something of a heist, which is made a little bit more complicated with a new love in his life (Elisabeth Shue), and his mom’s new husband (Paul Dooley). Overall, good times are had. The Underneath is probably the least-seen of Steven Soderbergh’s whole collection and well, with good reason. For starters, it’s unconventional storytelling isn’t the best for those who aren’t expecting it. Then, the story itself is really dark and a little mean. And lastly, it’s not perfect. It’s got some issues with figuring out whether it wants to be a direct homage to neo-noirs of yesteryear, or just a straight-up, raw, gritty, and rather emotional crime-thriller. Soderbergh himself even seems a little confused and is obviously wanting to get all sorts of style-cred from what he does on the screen, but mostly just seems to get caught somewhere in the middle between style and substance. 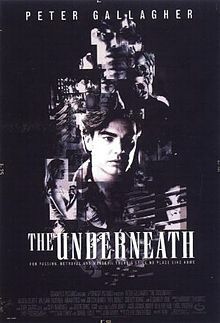 Thankfully, it is substance that eventually wins out and it’s why the Underneath is still a fine piece from Soderbergh. Not his best, for sure, but still well worth the watch because it shows what he’s able to do as a story-teller and how he’s able to put on so many different hats, and still have them work. For instance, there’s a lot of talkiness in the Underneath, but none of it ever feels boring or unnecessary; most of these scenes are helped to build characters, their relationships to one another, and how they may all figure when the going gets good. It’s smart, simple writing, but effective when done right and when you have to constantly think about which scenes go where and put together some sort of a puzzle, it helps out. The things we read while on break. It’s less about what Soderbergh’s trying to do, and more of what he is doing and it works. And with the Underneath, Soderbergh goes to some wild and unpredictable places, but it always tends to keep it grounded cause we care for these characters, no matter how awful they can be. Peter Gallagher is perfect as our anti-hero, Michael Chambers, who may be a total screw-up, but is the kind of screw-up these movies are kind to. But really, it’s William Fichtner as Dundee who steals the show as the menacing and sometimes insane foil to Chambers and the quiet life he wants to return to. We’ve seen Fichtner play these bad-guy roles for quite some time now in his storied-career, but this one may have been his best, because it allowed for him to stretch a whole lot more and become something of a human being. One with a heart, body, mind, and soul, as well as a whole lot of anger. Consensus: The Underneath doesn’t always work, but when it does, it’s still enjoyable, unpredictable, smart, well-acted, and stylish fun that remains one of Soderbergh’s trickier films. Petey Gallagher: Saving the day, one damsel at a time. While I liked it, Soderbergh admits it’s one of his least favorite films as he stated why he’s not fond of it as he was mentally-checked out during the production and was on autopilot as he wasn’t sure where he wanted to go next.